Papaya (Carica papaya L.) is the first fleshy fruit with a climacteric ripening pattern to be sequenced. As a member of the Rosids superorder in the order Brassicales, papaya apparently lacks the genome duplication that occurred twice in Arabidopsis. The predicted papaya genes that are homologous to those potentially involved in fruit growth, development, and ripening were investigated. Genes homologous to those involved in tomato fruit size and shape were found. Fewer predicted papaya expansin genes were found and no Expansin Like-B genes were predicted. Compared to Arabidopsis and tomato, fewer genes that may impact sugar accumulation in papaya, ethylene synthesis and response, respiration, chlorophyll degradation and carotenoid synthesis were predicted. Similar or fewer genes were found in papaya for the enzymes leading to volatile production than so far determined for tomato. The presence of fewer papaya genes in most fruit development and ripening categories suggests less subfunctionalization of gene action. 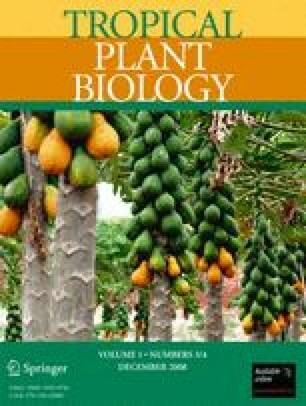 The lack of whole genome duplication and reductions in most gene families and biosynthetic pathways make papaya a valuable and unique tool to study the evolution of fruit ripening and the complex regulatory networks active in fruit ripening. The online version of this article (doi: 10.1007/s12042-008-9021-2) contains supplementary material, which is available to authorized users.